Unbelievable, but it’s 1st of April already! Where does the time fly?.. Spring is finally in the air, even though the nights are still pretty cold. I usually don’t blog on Mondays, but today is a special day. 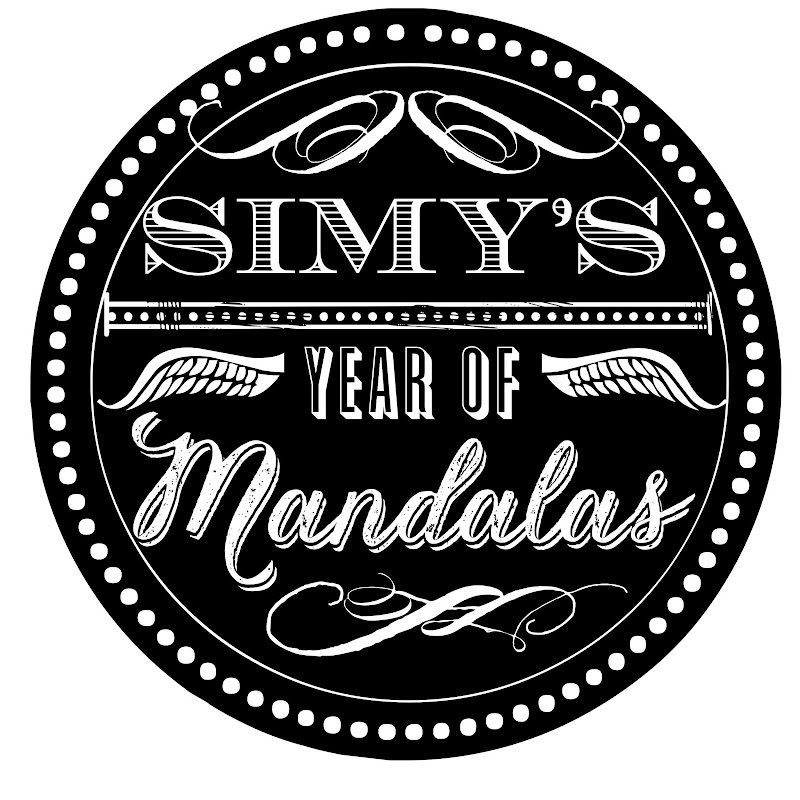 Today I am hosting Simy’s Year of Mandalas challenge. 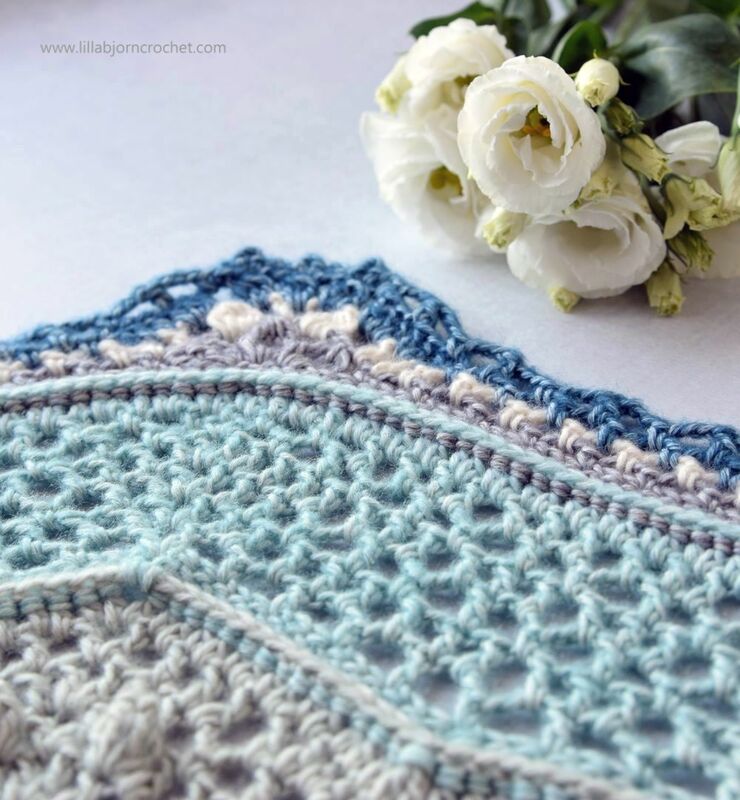 Every month Simy is designing a digital mandala and is asking everyone to join her and use it as an inspiration for your own crochet pieces. There are no rules, no patter, no stress. Just a pure joy of creating. The mandala don’t have to look exactly the same as drawing. You might be inspired only by colors, or some elements. 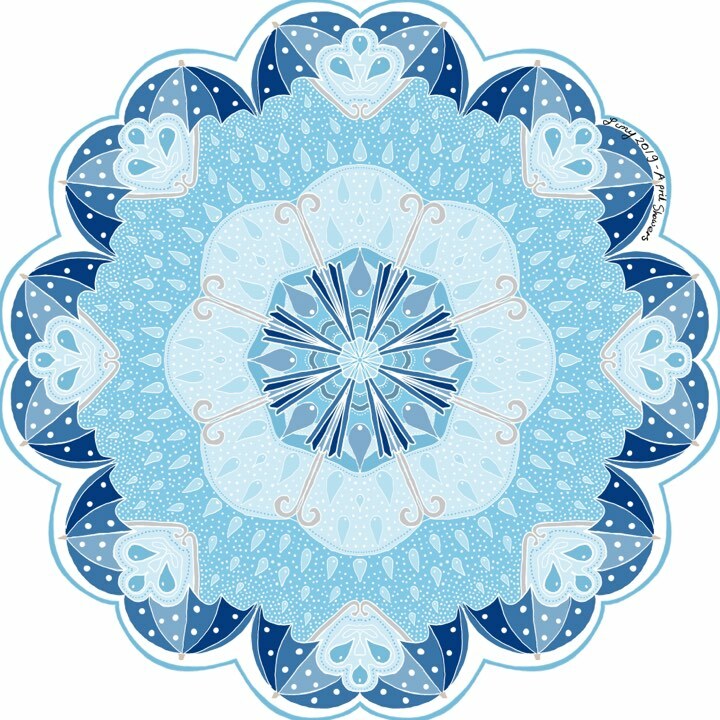 Here is Simy's mandala for April. 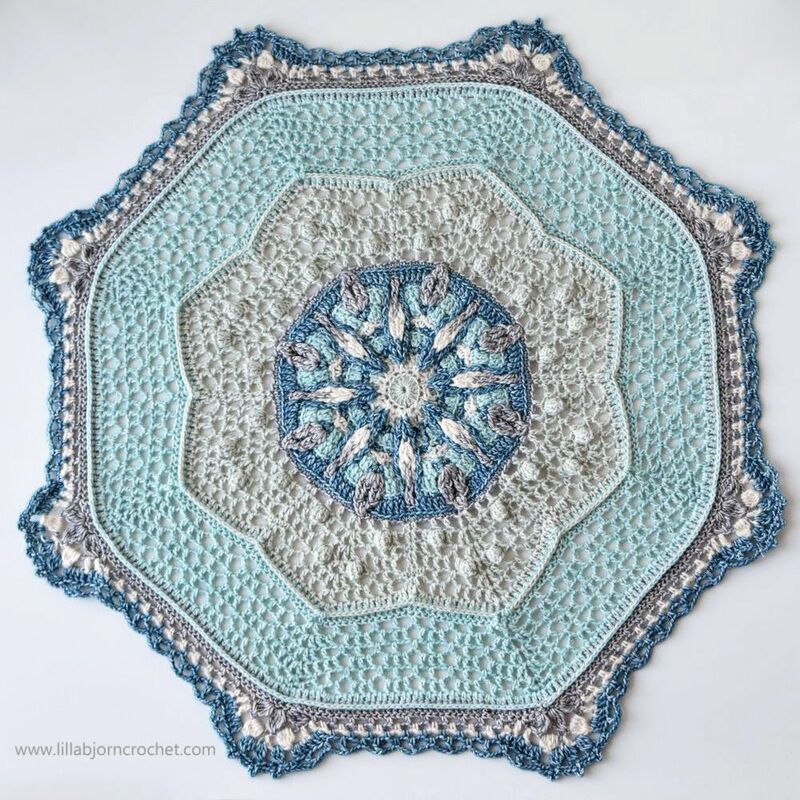 I took April challenge and crocheted my own mandala using four shades of Stone Washed* yarn by Scheepjes: Moon Stone 801, Amazonite 813, Blue Apatite 805 and Crystal Quartz 814. The mandala was born in just three days, as I switched my brain off and followed my heart. 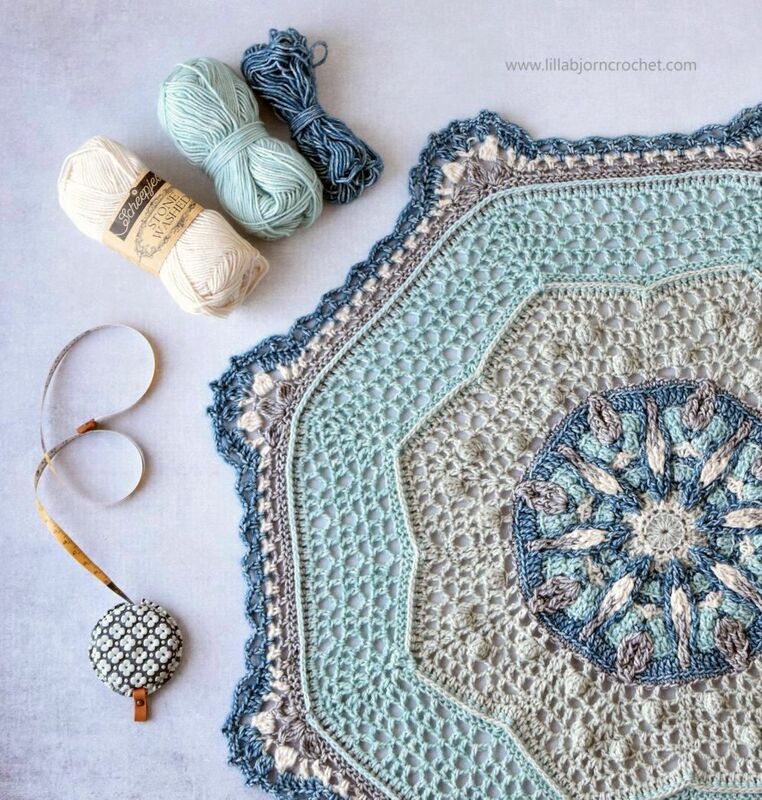 Why to crochet a mandala, you may ask? I’ve been crocheting them since I started to design. Mandala was the first item I learned overlay crochet with. And small mandala coasters were the first ones I wrote patterns for. You might have noticed that nowadays book stores are stuffed with colouring books. And many of them feature mandalas. Because they are known for a huge meditative and healing effect. And instead of markers and pencils we, yarnies, can use crochet hooks and yarns to “colour” our own mandalas. And what crochet mandalas can be used for, you may ask? You can use them in many ways: as doilies, wall and hanging decorations, pillow covers, chair pads – you name it. 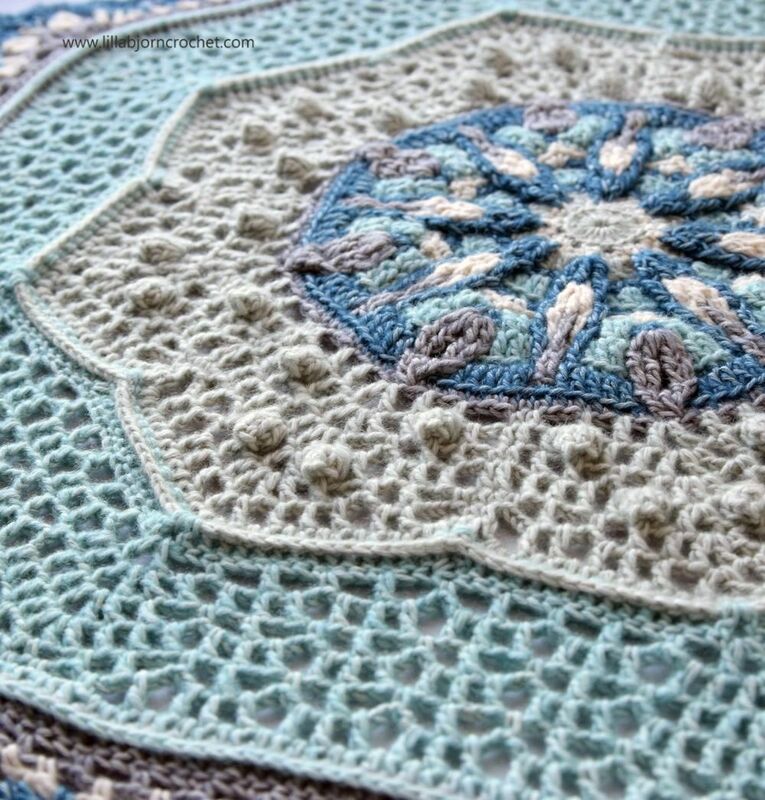 A while ago I wrote blog post about different ways of using crochet mandalas. Feel free to check it out! I haven’t decided yet on how I will use my new mandala… It’s quite huge – approx. 60cm across. It might make a nice top of the floor pillow or the pouf. No pattern yet, but if you interested in it, please let me know and we’ll think of something. We might even run a mini make-a-long? What do you think? So beautiful work!!! It gives me peace and joy. I'love the CAL. I'll think what I can do :) I need to write other patterns first, and then I might have time for this one. This is absolutely gorgeous. I could see it framed, hanging on the wall in my soon-to-be crafting room. :) I'd love a make-along of this. I love it! I love this so much! Very elegant. If you publish a mini-make-a-long, I'm in! So beautiful... Yes, I would love CAL too. Love this asa much as tge ocean! A make-a-long sounds perfect. Your mandala is breathtakingly beautiful. I'd love the pattern for it! Love it, love it, love it. A mini cal for this would be just amazing. Thank you so much for thinking of this. I would love to join a CAL for this. It’s beautiful. A rug or pouf? Yes please. Been wanting to do both! Beautiful, I am in if there is a cal big or small! Very lovely! I would like to do the CAL of make the pattern. So beautiful! Love the colors as well as your pattern. Yes, a written pattern would be an excellent idea. A mini make along would be fantastic! I've always wanted to make a mandala but need help with my skills. What a beautiful project to be my first mandala. I would love to join a cal to make the beautiful mandela ! It's so calm and elegant, I want it as a table topper Ooo! or even a rug! I would absolutely love it if you either put a pattern together or did a CAL. 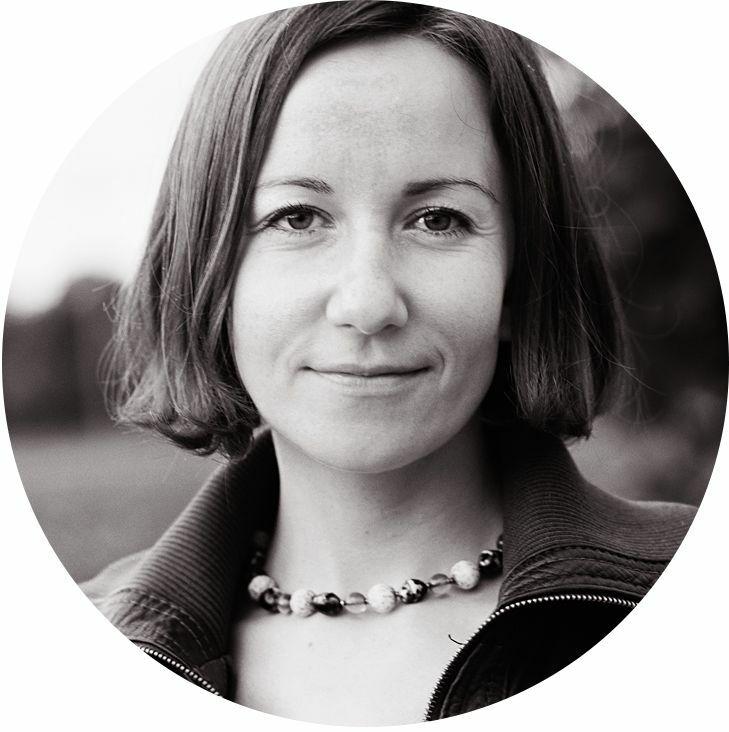 I do so love your designs! So lovely! �� A CAL would be great!!! Oh please make this a MAL!!! It's gorgeous! Oh my goodness this is GORGEOUS! I would love to do a CAL using this pattern! Love to see the pattern!! Great work and creativity! Simply stunning. I'd love to join a CAL with this. It's beautiful! A pattern would be lovely and a CAL even better. Yes, yes, yes, please write the pattern. It's lovely and I would love to make it. Beautiful! I would love to try my hand at crocheting one. Yes please! a CAL of this would be wonderful. It is absolutely stunning! thank you so much for being so generous with your creativity. Oh, so lovely! And so You! Can't wait for the CAL! I love your work. Keep following your beautiful heart! Never thought of make a Mandela but this is so beautiful i would love to try it. Please please a pattern!!! A pattern and / or a cal would be very very nice. It's beautiful and a pattern would be lovely!! Your mandala is beautiful! I'd love to join in on a CAL or at least have access to the pattern.